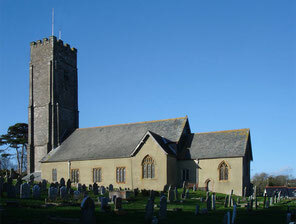 The first St Peter’s Church was erected on this site in 1272. The tower is 83 feet tall and dates from 13c; it houses eight bells, six were originally cast by Pennington Bros of Cornwall in 1777, one of these was recast by Gillett & Johnson in 1928 and two new bells cast by Whitechapel Bell Foundry, were added in 2016. The present clock was manufactured in 1878. The Church was completely restored in 1871. The pulpit was carved by 17 year old Violet Pinwell in 1891 and depicts no fewer than 60 animals! The organ pipes were hand painted in 1874 by Miss Edith Wyllys, an artist then aged 22 and living in Stoke Fleming. On the 17c brass of Elias Newcomen is a 17century pun saying that Elias is ‘New-come-in to heaven’s habitation’! The brasses on the floor of the nave date from 1391. The Norman Font still shows the marks of a hinge and bolt for locking, as specified when it was ordered in 1236. The War Memorial is a 14c wayside cross which was used as a gatepost until being restored and adapted in 1919.